I’m pleased to introduce myself as program manager for the Diversity, Equity and Inclusion (DEI) Initiative at the School for Environment and Sustainability (SEAS). I am the first person to hold my current position in the school, and I have been in my role for about a year. Dr. Dorceta Taylor, whom many of you know, is the school’s DEI Director. Both my bachelor’s degree and my master’s degree are related to the natural and social science dimensions of environmental studies. My graduate research focused on drivers and barriers for women advocates in Great Lakes conservation. I am a trained facilitator and have facilitated workshops ranging from cultural awareness to microaggressions to navigating difficult conversations. After graduate school, I worked for 9 years with Michigan Sea Grant and then for 2 years with CILER as Outreach Specialist based at the NOAA Great Lakes Environmental Research Laboratory. I dealt a lot with stakeholder conflict, who has access to information, who is ‘at the table’ and inclusion in my previous roles. I join nearly 20 other Diversity, Equity and Inclusion Program Managers and Specialists newly hired across the university in the past 1 ½ years. The impetus for our and other schools’ DEI initiatives came in 2015, when U-M President Mark S. Schlissel identified diversity, equity and inclusion as three of the university’s top priorities. President Schlissel charged every unit with creating a five-year DEI strategic plan, and Dr. Taylor led the development of the plan for SEAS. Its implementation largely began when I joined the staff. In the school’s strategic planning process, students, alumni, staff and faculty all had the opportunity to share their experiences and opinions anonymously through surveys administered late in 2015. Early in 2016, the DEI Office hosted a student town hall with 40 participants. Also in 2016, there were several focus groups for alumni, faculty, staff and students to further assess DEI gaps, needs and priorities. Information received from these processes are what shaped the school’s five-year DEI Strategic Plan. The DEI Plan is a living document and is edited and updated annually to ensure we are responding to emerging needs and that implementation meets the needs of the SEAS community. SEAS has just completed the first year of implementation. Though there is always more to do, we also want to celebrate our progress. We learned that having a variety of DEI events within our school allowed for greatest accessibility to ensure our community members participate in the way(s) that were most comfortable to them. For example, large school-wide events, such as the Martin Luther King, Jr. Service Event (a healthy foods drive in partnership with Food Gatherers) had participation from the alumni, faculty, staff, and student body. We also responded to national policies, such as the proposed immigration ban by the Trump Administration, with a call to the SEAS community to submit photos of where we are from or meaningful places, which spanned local and global locations. These photos were put together in a slideshow that we showed during the Food Olympics along with a banner that now hangs in the entrances to the Dana Building stating “All are Welcome Here”. 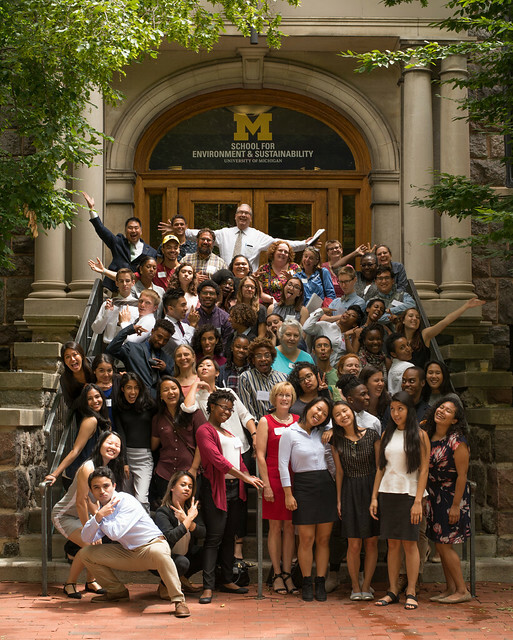 Training Workshops that I facilitated on DEI Topics and diversity mixers were also popular new programming and are highlighted in the U-M Year 1 DEI Progress Report. In addition, SEAS has implemented two highly successful pipeline programs. The Doris Duke Conservation Scholars Program aims to diversify the conservation workforce by finding and developing the next generation of land, water, and wildlife professionals among traditionally underrepresented groups. Forty undergraduate students participated in 2017. The Environmental Fellows Program (EFP) is a national program that seeks to diversify the environmental and conservation philanthropic sector by supporting the career aspirations of graduate students from traditionally underrepresented groups. Twenty-one graduate students participated in 2017. We are proud of our accomplishments this year and view them as a successful start to a long-term initiative. I welcome your ideas, questions, and feedback about the initiative, and encourage you to be in touch: soniajos@umich.edu. P.S. Hover over the image below to click through our DEI Photo Gallery.